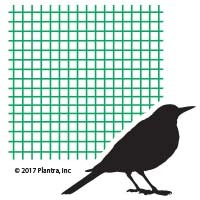 Plantra® Crop Saver™ Multi-Net Backyard Garden Size (21ft x 250ft) Is 4 nets In One! It's A Hail Net - Many a harvest has been wiped out in a single hail storm. 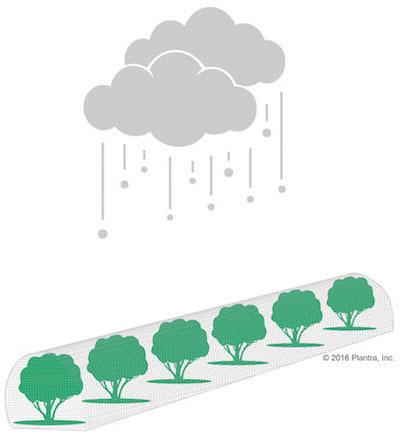 Crop Saver Multi-Net is the answer for superior hail protection. Engineered rugged, Crop Saver's knitted, interlocking construction blankets your crops to block hail and preserve your fruits and vegetables all the way to harvest. It's A Pond Net - Tired of having your pond fish (and other aquatic life) eaten or killed by herons, crows, kingfishers, ravens and raccoons? Crop Saver stops birds and other critters from raiding your crop of fish and other aquatic plants and animals. Multi-Net's tightly knitted construction and .16in x .28in mesh size keeps beaks and claws outside and your prized Koi, goldfish, rosy red minnows and mosquito fish safe inside. 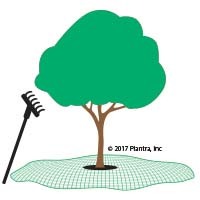 It's A Harvest Net - Crop Saver Multii-Net is perfect to lay on the ground as olive netting or support with framing to catch figs, peaches, cherries and other tree fruit and nuts during harvest. Rugged construction holds the crop safe and is safe to walk on unlike plastic sheeting which can be hazardous, especially when wet. It's A Bird Net - Multi-Net is a protective barrier to protect crops and ponds and also doubles as a harvest net. But let's not forget about the birds that can also eat and ruin grapes, blueberries, raspberries, strawberries, tree fruit, vegetables and other garden crops. Multi-Net keeps birds out and your future harvest safe inside. Don't let your crop go to the birds, protect with Multi-Net! Note: Seasons* refers to the 4-8 week ripening period just before harvest when netting is best used. Seasonal netting is intended to be removed at harvest and stored out of the sun in a dry location until the next use.